Iraqi soldiers rolled into Kirkuk to take back control of the area's oil fields, air base, power plant and refinery. Iraqi forces pushed into the country's northern region, taking away several locations from the region's Kurdish government. Iraq called the move an attempt at unity, while Kurdish forces vowed to defend their sovereignty. Iraqi soldiers rolled into the city of Kirkuk and surrounding regions to take back control of the area's oil fields, air base, power plant and refinery. Iraqi Prime Minister Haider al-Abadi wrote on Facebook that his forces "only acted to fulfill our constitutional duty to extend the federal authority and impose security and protect the national wealth" in Kirkuk. While Iraq's northern region is predominantly Kurdish, Kirkuk is home to both ethnic Turkmens and Arabs. Kurdish peshmerga fighters took control of Kirkuk in 2014 after Iraq's military collapsed following confrontations with ISIS. Both Iraqi forces and the Kurdish peshmerga are supplied and trained by the U.S.-led coalition fighting against ISIS. Kurdistan's security council tweeted that Iraqi forces were using U.S. equipment in their push into Kirkuk. The Kurdish people are often considered to be the world's largest ethnic group without an internationally recognized homeland. 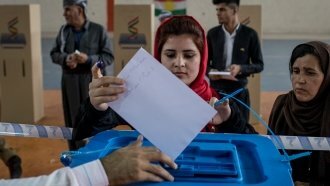 In late September, Iraqi Kurds voted overwhelmingly for independence in a nonbinding referendum. But that didn't sit well with Baghdad or Ankara. Iraqi and Turkish troops staged joint military drills on the border with the Kurdish region following the vote. While some peshmerga and other Kurdish fighting forces gave ground to the Iraqi army without violence, other forces loyal to the region's leader, Masoud Barzani, fought back. Those groups say they're ready to fight as long as need be.